The wait is finally over…I can finally show you my holiday home and I couldn’t be more excited! There are big changes in here! In fact, everything is completely different from last year, and it’s just the change I have been waiting for, for so long. 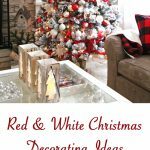 Over the years I have yearned for more traditional Christmas decor and colours, and finally that is happened with help from Lowe’s! 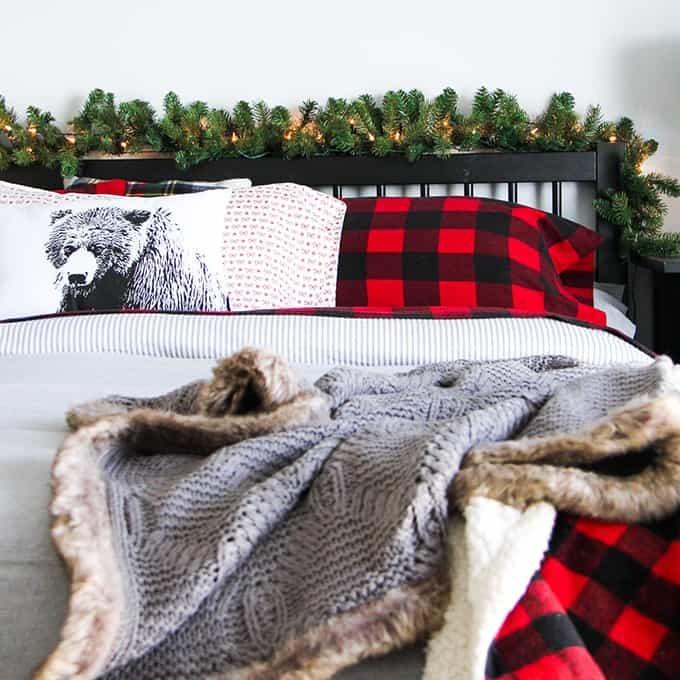 I’ve brought in reds, greens, whites, plaids, faux fur, and a lot of natural elements. It’s like a country Christmas in the suburbs! The biggest change we made was with our tree. As you may remember from my last post, we decided to put up an artificial tree this year, which is the first time this has happened in my entire life. For real. I have always had a real Christmas tree, but this year we broke the tradition…but don’t worry, we are LOVING our new tree. 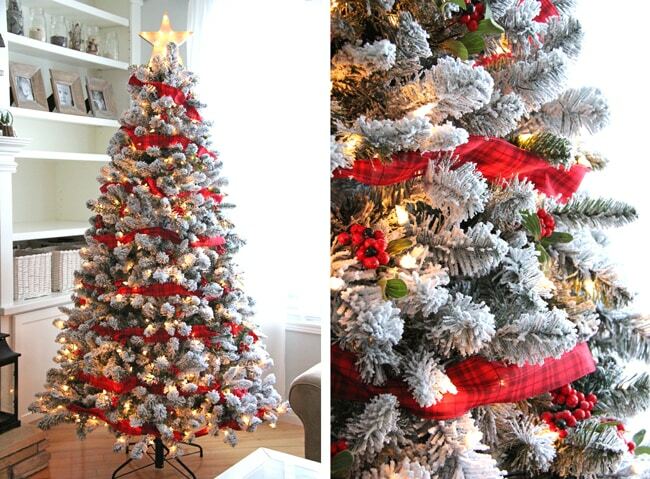 It’s not just any tree, it’s a flocked tree. I grew up in Northern Alberta where the trees really looked frosty like this in the winter, so this tree makes me SO happy. 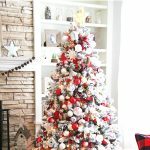 Actually, when I started decorating the tree, I loved how beautiful it looked just standing on it’s own and I almost didn’t want to decorate it! But I had a vision and I was going to make it happen. 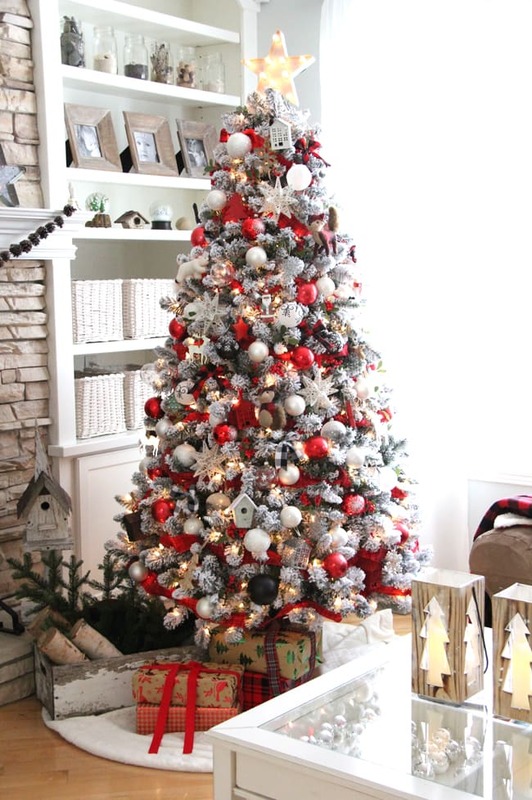 This tree was so easy to put together…honestly it took me less than 5 minutes to put it up, plus it came all decked out with lights, so I didn’t even have to string them up! Now that the tree was up, it was time to bring my vision together. I started by tucking little red berries all throughout the tree. Then I wrapped the tree in some beautiful plaid cloth ribbon which makes a perfect garland, and adds just the perfect amount of red. I love how it looks. And now the real fun begins! 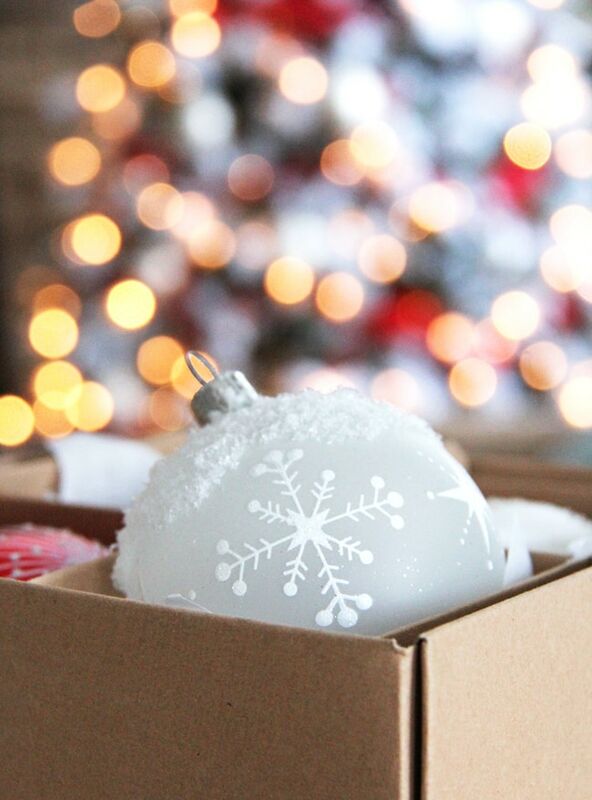 I’ve decked the halls and I can’t wait to show you how it all came together. Shall we get started? Welcome to my holiday home…it’s Christmas in here! 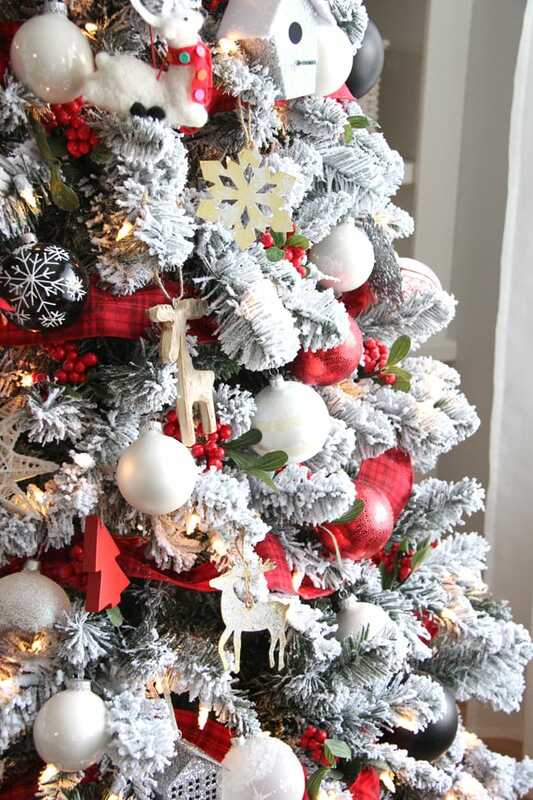 Let’s start with our tree because it’s the focal point of our living space and really sets the tone for the rest of our holiday home. I am in love with our tree. IN LOVE. And I’m so relieved that our whole family loves it too. Part of me was afraid to change our decorations, because kids often dislike what they’re not used to. And to be honest, trying to convince the kids that we weren’t going to get a real tree this year was a challenge…that is until they saw how it all came together, and they love it too! This makes me more happy than I can say, because really, the magic of Christmas is about the kids. 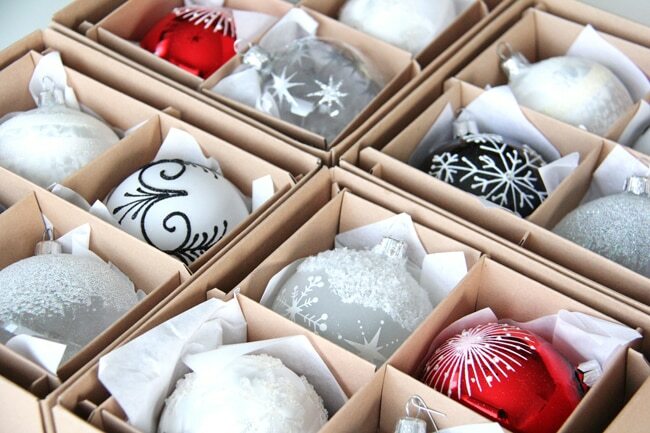 Together we filled our tree with so many stunning ornaments…white, clear and black glass ball ornaments, teeny tiny birdhouses, woodland creatures, wooden ornaments, plaid bows, snowflakes, stars, and plenty of our most cherished ornaments. 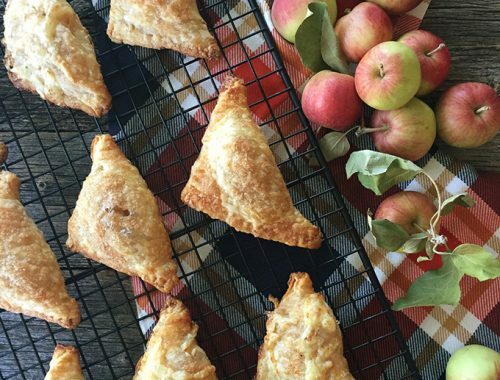 It’s a beautiful blend of old and new. I wish you could see what it all looks like at night! One of my most favourite things to do during the holiday season is to sit down at the end of the day with only the lights of the tree on. It’s so cozy and pretty. I always miss this part the most once Christmas has passed. Our pup loves it too. This is Molly’s new place to sleep…I bet it’s cozy down there. 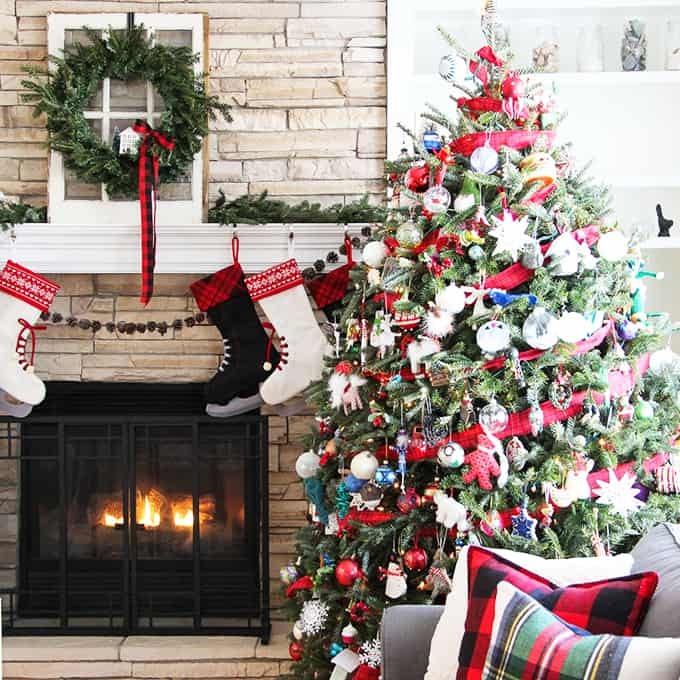 Once the tree was decorated, I turned my attention to the rest of our living room, and because the tree was so full, I wanted the decor in the rest of the room to be a bit more simple, especially the mantel. So I decorated the mantel with very minimal decor and I think it balances the tree perfectly. 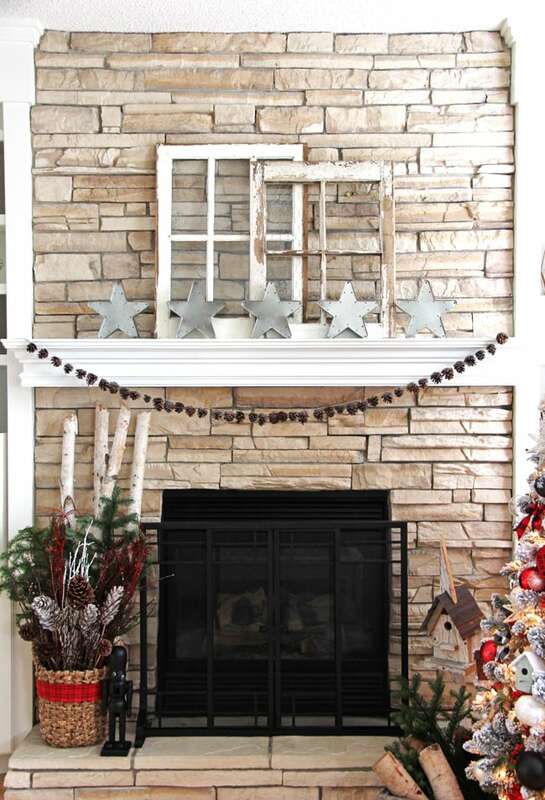 I might even leave the mantel the way it is after the holiday decor comes down! 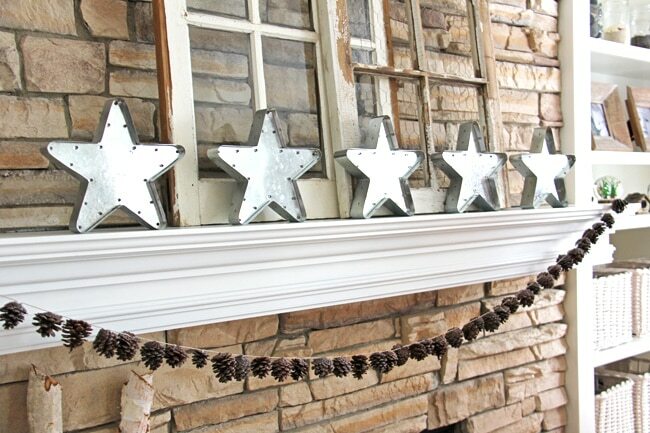 A simple pine cone garland and metal star lights was all the mantel needed! Ok, it also needed a pretty holiday arrangement! 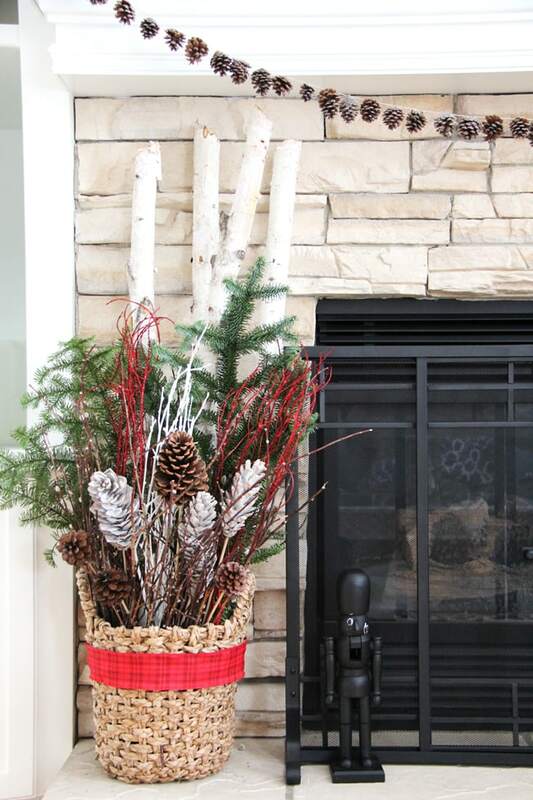 I love bringing the outdoors in, and this arrangement is the perfect way to do this…evergreen branches, birch logs and pine cones wrapped up in plaid. It also ties in with the tree really nicely. 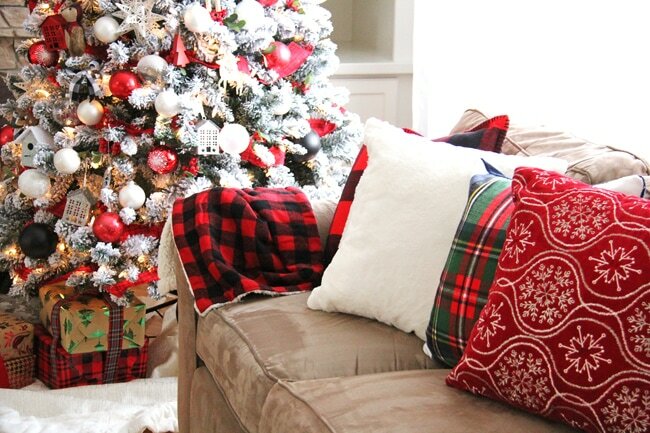 This view from my couch is my favourite…all nestled in with cozy pillows and a perfect view of the tree. 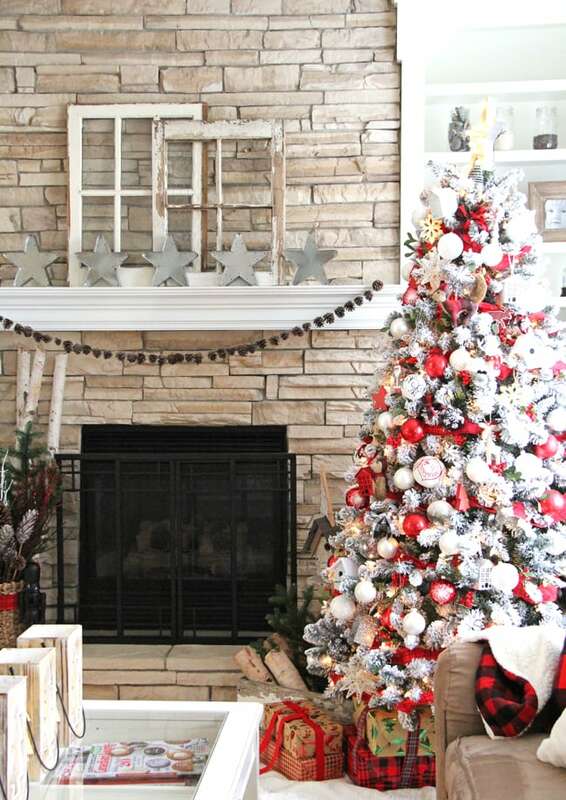 Once the tree and mantel were complete I added more Christmas decor throughout my main floor. 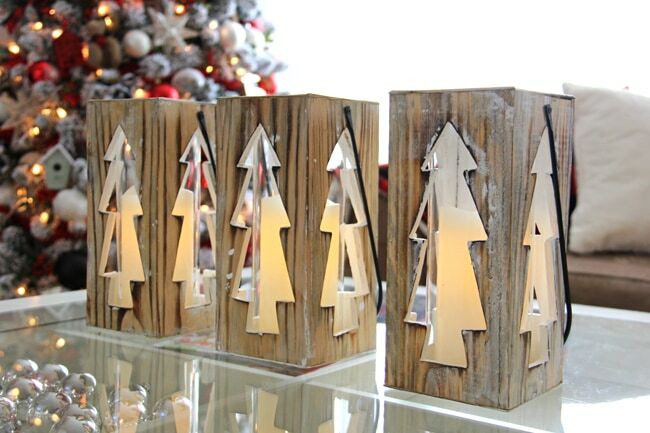 These wood lantern candle holders are so pretty, and they look great at night too! 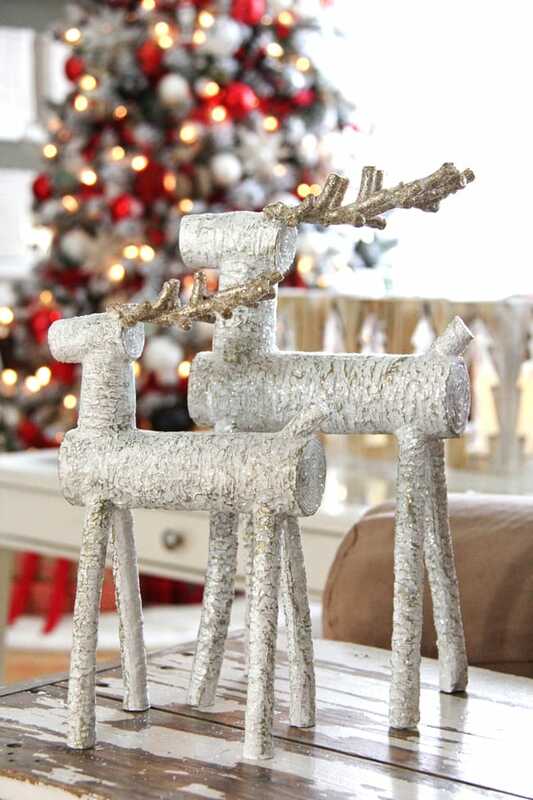 Who could resist these adorable deer? 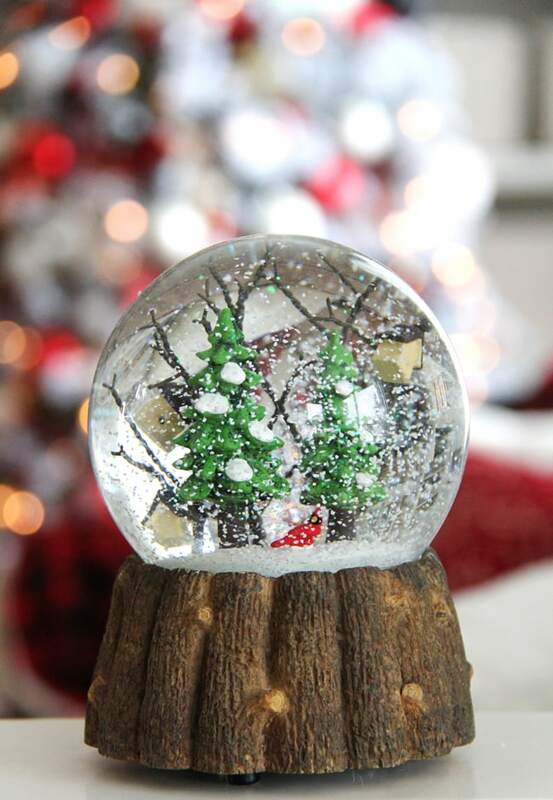 Or a winter snow globe? I love this one. I also hung up my simple evergreen wreaths with more of the same plaid ribbon found on my tree. 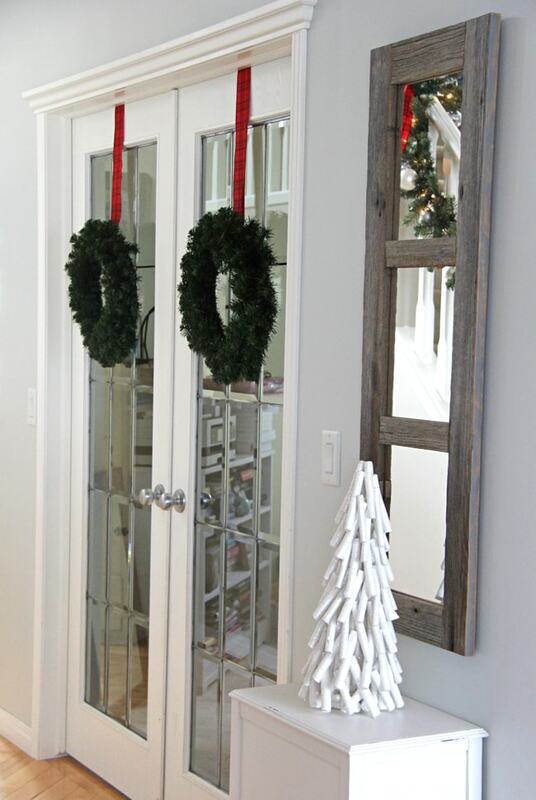 I absolutely love the look of wreaths hanging on doors and windows, even indoors! 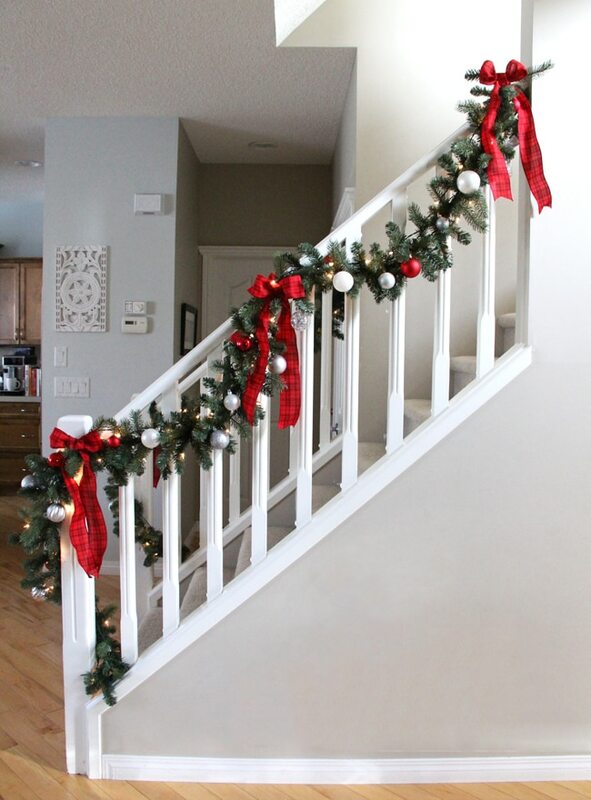 It wouldn’t feel like Christmas here without the staircases getting decked out as well! 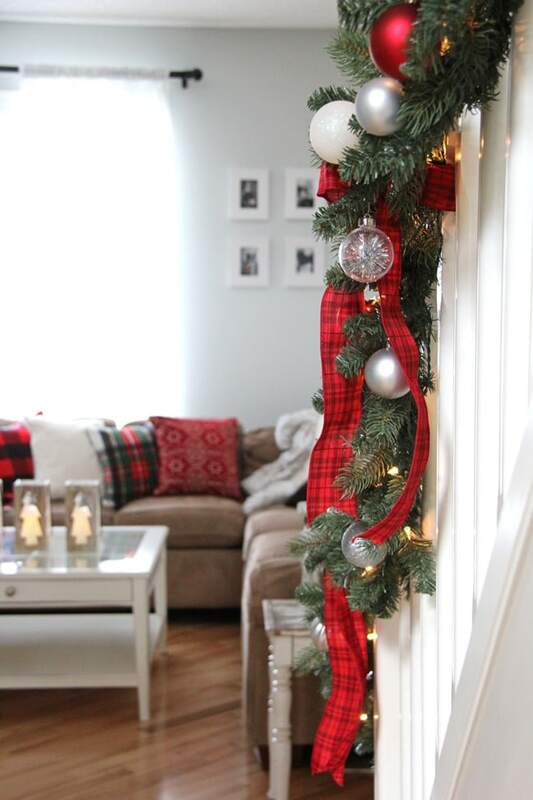 I hung new evergreen garlands on our staircases all decked out with white lights, red and silver ornaments and red plaid bows. So pretty. 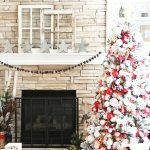 I’m so thrilled with how everything turned out…I really am a classic Christmas kind of gal, and I’m happy to finally embrace it! Thank you all so much for stopping by today to take a tour of my holiday home, it means so much to me to have your here. 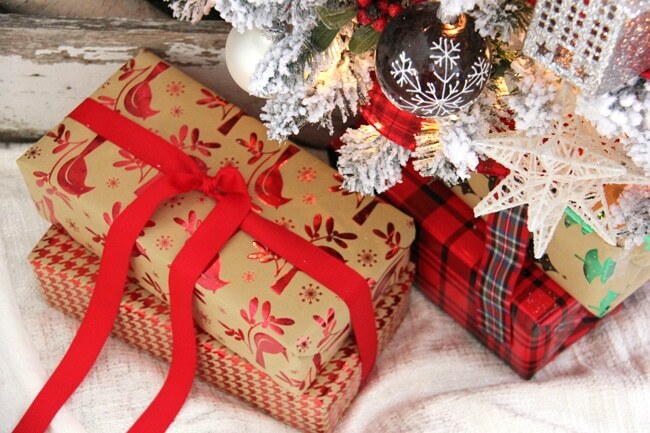 I hope you are having a lovely Christmas season! 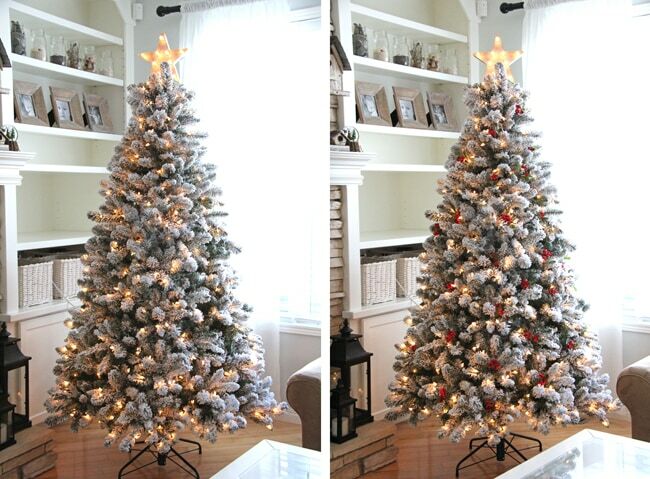 Looking for more Christmas Home Inspiration? Here’s my Merry & Bright Christmas tour from last year! 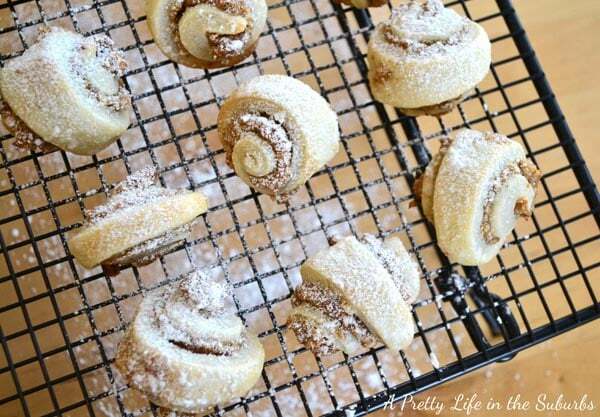 Have a very Merry day! And thank you to Lowe’s Canada for making this all possible for me! Ummm, wow. Going to head to FB now to see if you have a keepin-it-real photo to make myself feel better. But seriously, beautiful Jo-Anna, well done! Hahaha! I’ll make sure to post one soon – I love doing those! And thank you as well – I really enjoyed putting everything together! It’s absolutely stunning! You did Lowe’s proud! Thank you so much! I’m so happy with how it all turned out!! 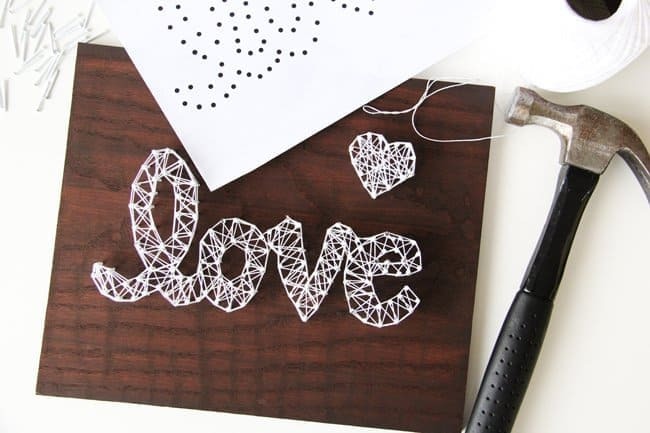 Really nice, you have a lot of creativity, and skill. Jo – It’s so gorgeous and FULL! I love it. Thank you Tara! I love love love our tree!! SO much! SOOOOOOOO beautiful J! 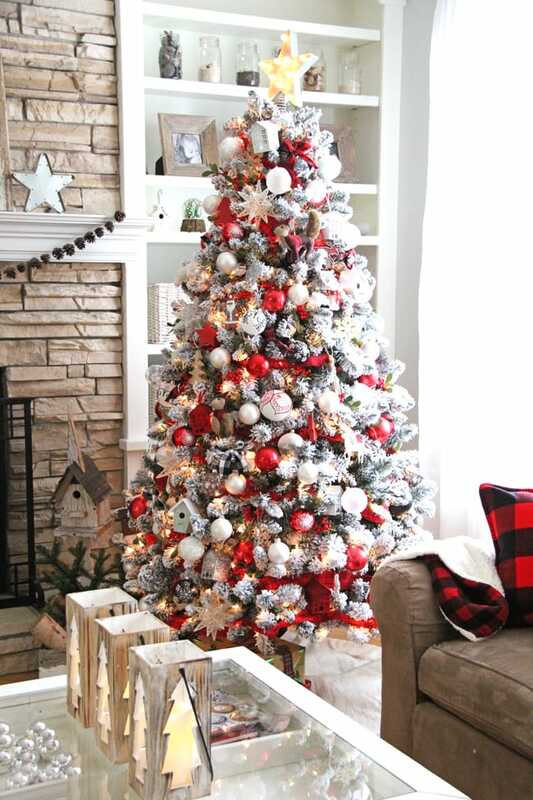 I love every spec of your decor, and so jealous of your flocked tree, it really makes it so magical! I have to check out all the fabulous decor at Lowes! Thank you V! I am really really loving our Christmas home this year! 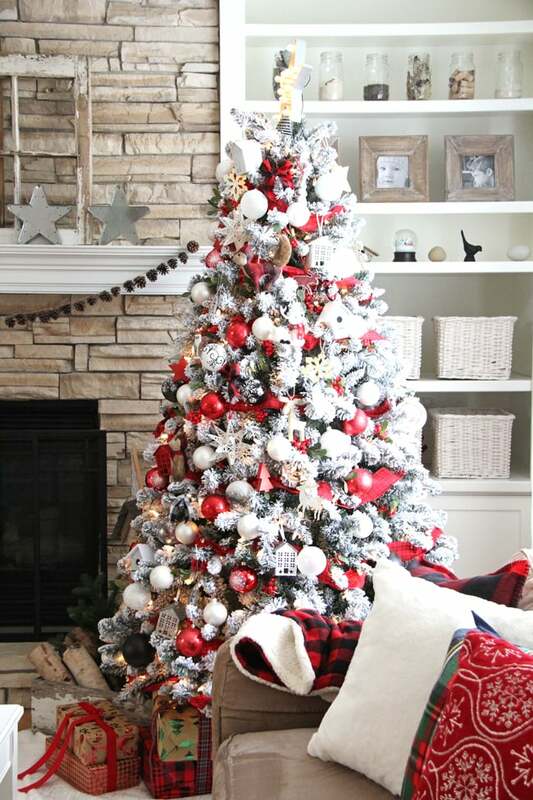 I hope you have a place in your basement or garage to store your tree, keeping it EXACTLY like it is for years to come, because it is PERFECTION!!!! Well done, everything is beautiful! 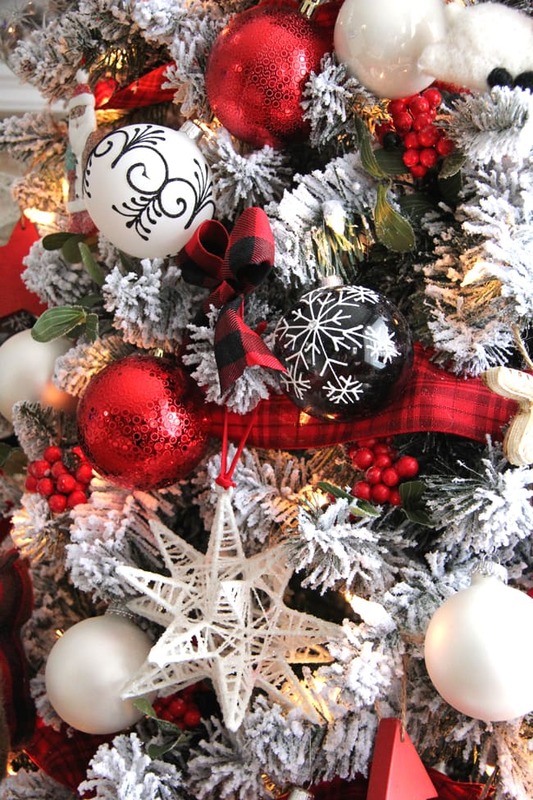 ENJOY a wonderful Christmas season!!!!! Thank you so much Sarah! And that really is the dilemma isn’t it…how do I store it just as it is?! My poor basement hahaha! My daughter has a huge sheet she tosses over the whole lot of it, then carries the tree ever so carefully downstairs (well, the hubby does this part!) and tucks it in a dark corner of the cellar! It works!! Good Luck! That is a good idea! There is something so nice about being able to just put it back up next year the way it is! Everything is gorgeous and festive! I love it all! What a gorgeous tree! I love the flocking and all the red touches. Love the rustic decor too! WOW! Your tree and house are SO STUNNING! I’m honestly jealous haha. happy holidays and new year to you! 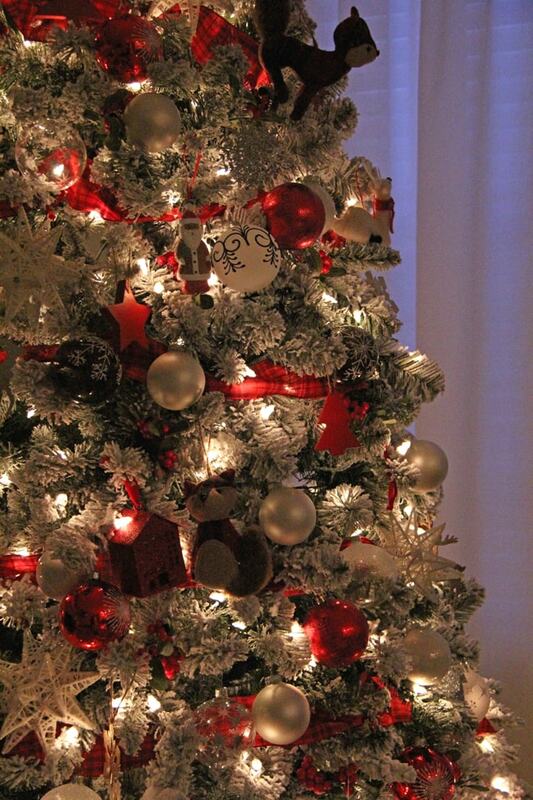 I absolutely l o v e your Christmas Tree, dear one!!! The other thing that caught my eye was the garland on the stairs!!! 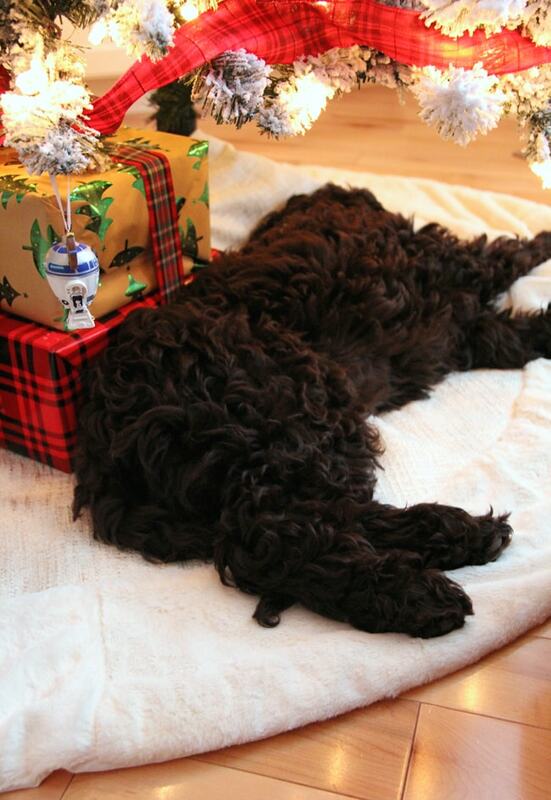 Thank you for sharing your lovely home for Christmas!!! Wow- your decor and incredible pics are awesome. 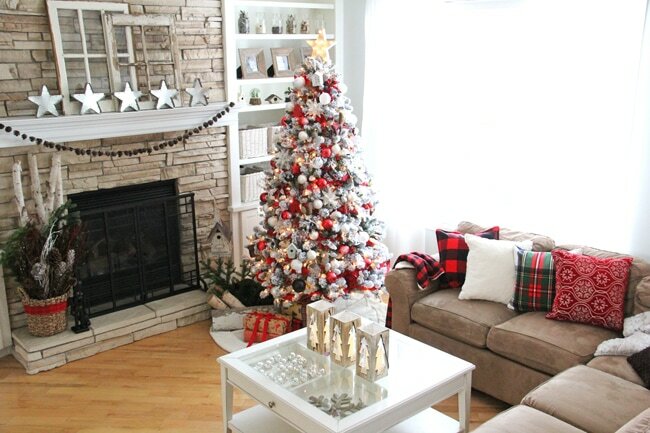 I love this room and would love to be sitting there with you and your cute furry friend sippin hot chocolate and talking about how short-but-great Christmastime always is…………..over before we’re ready, that’s for sure.